In Weed Pro’s professional and knowledgeable opinion, it is an over sold service by many lawn care providers. De-thatching is often offered as a part of a spring clean-up service, for the purpose of removing much of the yellow grass and giving your lawn a fresh clean look for a “good” start to the growing season. 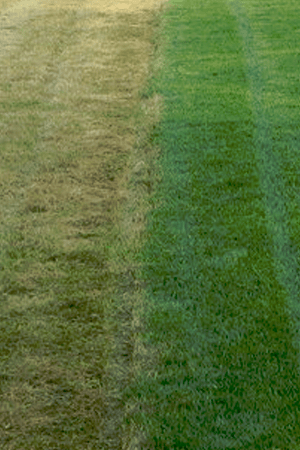 In reality, the process of de-thatching a lawn is extremely harsh to the grass plant. Damage to the crown of the grass plant will stint it’s development by about a month and/or kill the grass plant completely. In my 12 years of experience providing lawn care, I have seen only a half dozen lawns or so that truly would benefit from the service. Thatch management is better achieved through annual aeration, recycling/mulching your grass clippings rather than bagging your grass (bagging your grass is the worst thing for thatch management. Read more), using organic fertilizers, and slice seeding which cuts through the thatch layer and mixes it with soil every 1.5 inches. of the lawn can be done.